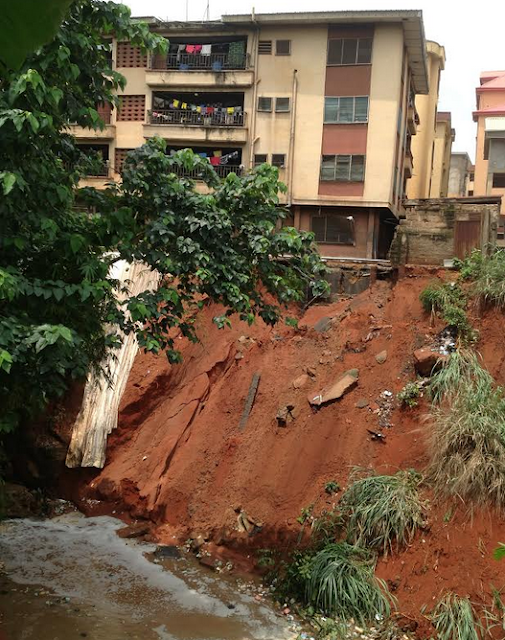 A widow, Mrs Theresa Okoye who resides at No 21A John Nwadiogbu Street, Omagba,Onitsha,on Friday threatened to commit suicide if her pleas on authorities of the state government and the World Bank fail to address the gully erosion which has already pulled down a section of her three story building and threatening the entire building. Mrs Nwadiogbu was lamenting before an advocacy team of the Voice-To-The-People (V2P) arm of the Justice,Development and Peace Commission(JDPC),Catholic Archdiocese of Onitsha who went on assessment tour of erosion and flooding sites in Onitsha. 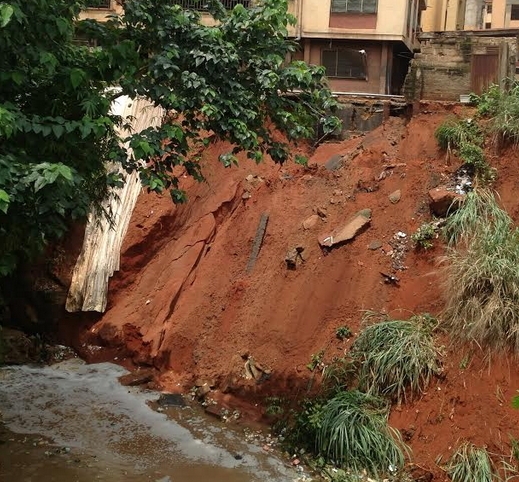 Narrating her ordeal before the team,Mrs Okoye said the erosion started some years back when a construction firm doing one of the express roads channelled the flood to their area in Omagba quarters and it subsequently created a channel through which the flood hit her compound. According to her,her late husband made all necessary efforts to get the government do something about it but all fell on deaf ears adding sadly that it was one of the things that contributed to the untimely death of her husband.She pointed out that actually,some state government officials had visited but with only promises to go for it. She confirmed that officials of the World Bank had also visited the site but that nothing has since been done while the situation has gotten worse and spreading to other nearby buildings. Speaking to journalists, one of the landlords in the area,Chief Alfred Mbonu described the situation as pathetic,pointing out that some of the people in government are hard hearted and uncaring. 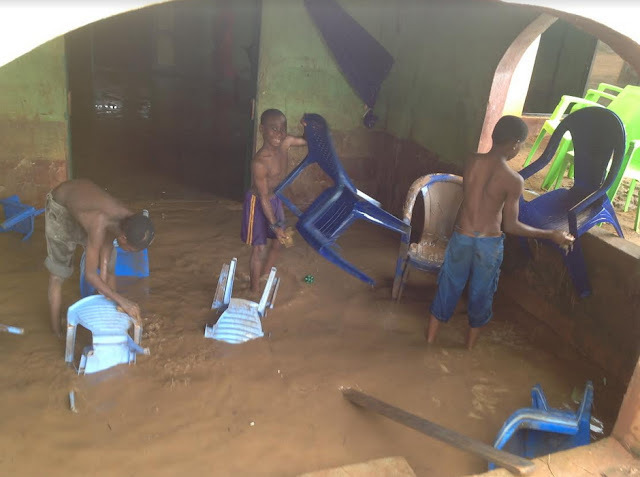 In some parts of Ogidi,Nkpor and Awka,the flooding occasioned by heavy rainfall reportedly damaged property and sacked some residents. 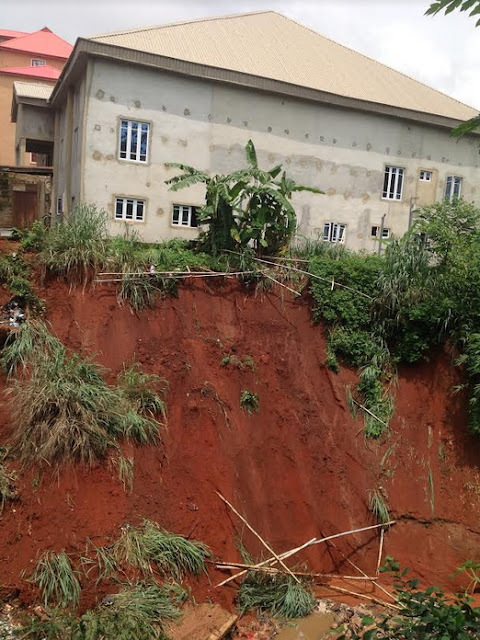 At Fegge,Onitsha,some buildings were submerged particularly those erected within the Nwangene axis as affected residents were seen scooping out flood water from their homes. The above photos show part of the building under threat, other affected buildings and residents stranded with their property scattered all over the place. This is clearly an erosion prone area that needs urgent attention by the state government. 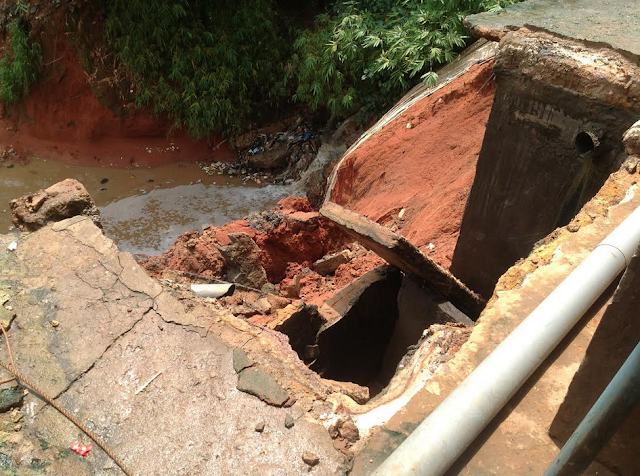 But because of unbridled corruption and total neglect,both the state and the federal government will not see the danger faced by the helpless residents of Anambra state living in this region. Then tell me why Anambra residents suffering from this erosion nightmare will not buy into the peaceful agitation of Biafra, especially one that called for boycut of the upcoming governorship election in their state? Today our corrupt government priority is based on how to strengthen and solidify their various political affiliations so that they can win 2019 general election. Much of the environmental projects for which billions have been allocated has been largely abandoned. Unfortunately, what is unknown to the southeast state governors is that,the more they contribute to the marginalisation of Igbo people the more the cry and support for Biafra will continue to gain earthwide popularity and backing,a prelude to achieving Biafran sovereignty.